This sculpture originally came to lower campus in Summer 2017 as part of La Balade pour la Paix, an open-air museum along Sherbrooke Street, created by the Montreal Museum of Fine Arts in collaboration with McGill University, for Montreal's 375th anniversary. The generous support of the Monk Family Foundation has allowed the Visual Arts Collection to keep the sculpture on loan to McGill, where it will continue to enhance the outdoor space on lower campus. 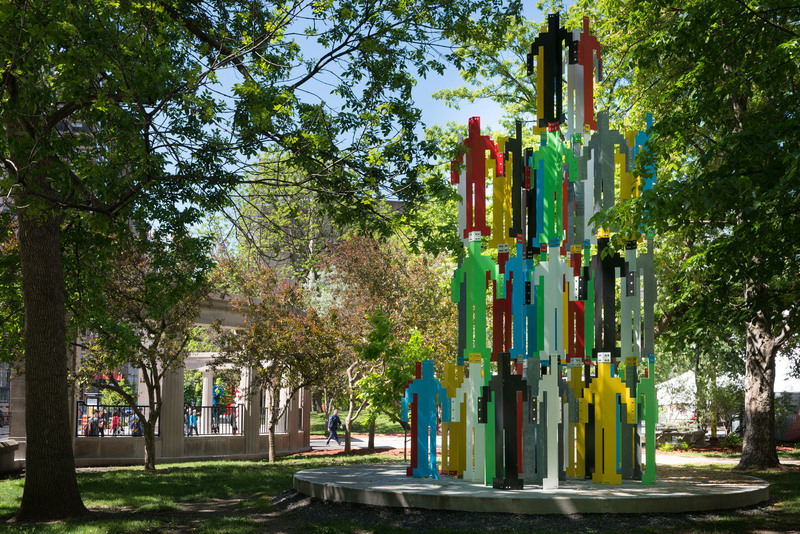 Centering on themes of community and the individual's relationship with their environment, the sculpture is especially suited to display on a University campus. Jonathan Borofsky, Human Structures, 2010. On loan from the Vancouver Biennale. Photo: Denis Farley. Following his studies in the United States and France, Jonathan Borofsky set up his studio in Ongunquit, Maine. A private man, his public artworks have nevertheless made their way around the world. In 2008, he produced a 20 metre People Tower, with 136 figures, for the Olympic Park in Beijing. Human Structures, instead, was commissioned for the 2010 Winter Olympics in Vancouver. Partly inspired by monuments to workers, the sculpture also evokes human pyramids, the most famous of which are the “castells,” or castles, of the Catalans -human pyramids that can reach up to ten storeys.